This sample was created in ConceptDraw DIAGRAM diagramming and vector drawing software using the Floor Plans Solution from the Building Plans area of ConceptDraw Solution Park. The Floor Plans Solution provides templates, samples and libraries with large quantity of vector objects that will help you to create the building plans of any difficulty easy and quick. This sample shows the Floor Plan of the hotel. The Floor Plans created with ConceptDraw DIAGRAM are vector graphic documents and are available for reviewing, modifying, and converting to a variety of formats (image, HTML, PDF file, MS PowerPoint Presentation, Adobe Flash or MS Visio). A floor plan is an essential element of any building or architectural plan. It shows a view from above of relationships between physical features on one floor of a structure. Thanks to modern digital drawing tools, you can easily learn how to create floor plans. Software like ConceptDraw DIAGRAM v12 provides an intuitive and modern interface and an assortment of powerful tools, so that nothing will get in the way of your creativity. When considering a moving to a new office, or making rearrangement of an office, its better to draw an office floor plan picture. The objective of any office space organization is to maintain a business functionality in a proper manner. This diagram illustrates a layout of usual cubical office. It shows just walls, windows and cubicles. You can use it as a template for your custom office layout diagram. the all you need is to launch ConceptDraw DIAGRAM v12 with its Office Plans solution. Then, you can make changes and add necessary equipment, using the vector objects library, supplied with solution. ConceptDraw DIAGRAM v12 diagramming and vector drawing software extended with Gym and Spa Area Plans solution from Building Plans area of ConceptDraw Solution Park contains a set of examples, templates and design elements libraries for drawing Gym Workout Plan, Gym Floor Plan, Gym Layout Plan, Spa Floor Plan, Fitness Plan, etc. Designing Spa Floor Plan? What can be easier for ConceptDraw DIAGRAM v12 users? Use the tools of Gym and Spa Area Plans solution from Building Plans area of ConceptDraw Solution Park to depict any of your ideas for the Spa Floor Plan. ConceptDraw DIAGRAM v12 is a powerful diagramming and vector drawing software. 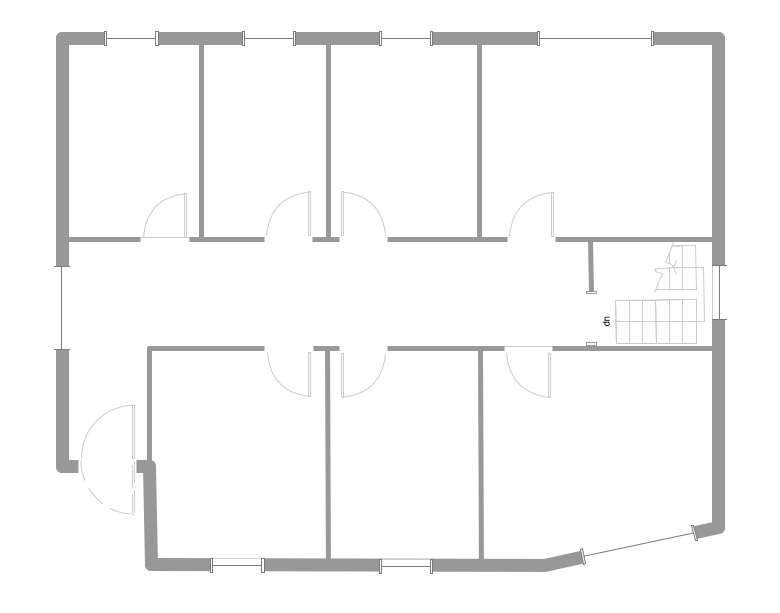 Extended with Office Layout Plans Solution from the Building Plans Area, ConceptDraw DIAGRAM v12 became the ideal software for making Office Floor Plans.